Detective Violet Baker and her alien partner, Dzholh “Joe” Ban!drn are sent down from the floating city of New Orleans New to rescue some people from dirt side, New Orleans Old (NOO), before a major hurricane strikes. But nothing goes right from the beginning of the mission and Joe soon realizes that the hurricane has been sent by an evil being who has infiltrated Vi’s city. The entity is using the hurricane to get Joe to reveal himself. The action is fast and furious in this story and I felt as if I really were in a hurricane. In the middle of the storm, as Vi and Joe are trying to complete their rescue mission, Joe realizes that the entity is playing them. Soon the rescue mission is not the focus. Trying to stay alive takes priority and Joe has to discover just who has been taken over by the evil force. Joe can’t trust anyone and meanwhile the storm rages. The setting is described in great detail, whether it is the ship that Vi and Joe are in, or NOO. It was fascinating to read the descriptions of a storm damaged NOO which certainly rang true to what could and has happened to the present day New Orleans. The technology described was also very interesting and certainly consistent and believable. Joe is attracted to Vi, but has no idea how to proceed, or even if he should. Vi really likes this vaguely purple alien, but again, she seems uncertain. It is entertaining to watch them interact, and the dynamics between them are at times quite humorous, breaking the tension a bit from the approaching hurricane. 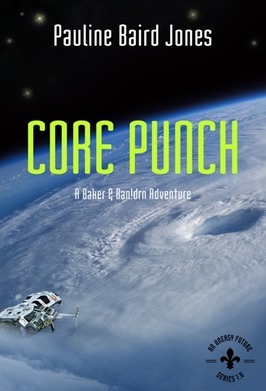 Readers of science fiction are sure to enjoy this intriguing adventure between a human and an alien, both determined to make their world safe.